This year’s candidates for Associated Student Body president disagree on the state of campaign finances almost a full school year after the ASB Election Reform Task Force was established. Founded this past fall, the task force’s mission has been to make the Ole Miss student elections more accessible. “I think people are encouraged that we are looking at the budgets and spending of candidates, but we still have a long way to go in terms of getting more diverse people running for campus elections,” said Katherine Sistrunk, co-director of the task force. While the task force was not officially formed until last fall, Sistrunk said one of the main accomplishments ASB has made in election reform occurred in April 2018 when the Senate voted to lower the limits for candidates’ campaign budgets. In the last general election, presidential and vice-presidential candidates were able to spend up to $1,500, while other candidates for executive office had a spending cap of $1,000, and Senate campaigns were limited to a budget of $300. This year, the spending caps are $1,000 for all candidates for executive offices and $100 for Senate candidates. ASB presidential candidate Barron Mayfield said he does not agree with the lowered limit on campaign spending. However, he suggested creating a process for ASB to fund a portion of each candidate’s campaign. ASB presidential candidate Tom Fowlkes said he is in support of election reform and a constant re-evaluation of the system to ensure that every student is given equal opportunity to impact change at the university. The Election Reform Task Force also worked with the ASB Senate this semester to pass a bill shortening the campaign period from 16 days to 12 days, which will come into effect in the fall 2019 personality elections. Sistrunk said one of her main goals within the task force is to institute equal access for all students, Greek and non-Greek, to run for elected leadership roles on campus. She thinks the combination of a shorter time campaigning and lowered spending will help do so. Part of the problem Sistrunk sees is that, while candidates are not required to spend the maximum amount on their campaigns, they are at a great disadvantage if they opt to spend less. 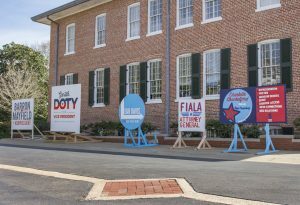 “You don’t have to spend all that money, but if you don’t spend the money to have the signs, stickers and everything, it’s hard to even compete in an election,” Sistrunk said. The task force is not currently meeting because of Davis’s campaign for ASB president, according to Sistrunk, but it plans to reconvene after the election season. Davis is the only non-Greek candidate running for an executive position in ASB this year. Sistrunk said to expect legislation addressing the lack of diverse students and representation in fall personality elections to come to the ASB Senate floor by the end of the semester.